This week I was looking for design inspiration for websites dealing with clients in the financial sector. After looking over dozens of examples of equity fund, online trading and real estate investment group sites, I encountered some good wireframe and design ideas that fit well with the model of my client. Wanting to be thorough, I decided to finish the exercise with an overview of the top ten investment groups in America. 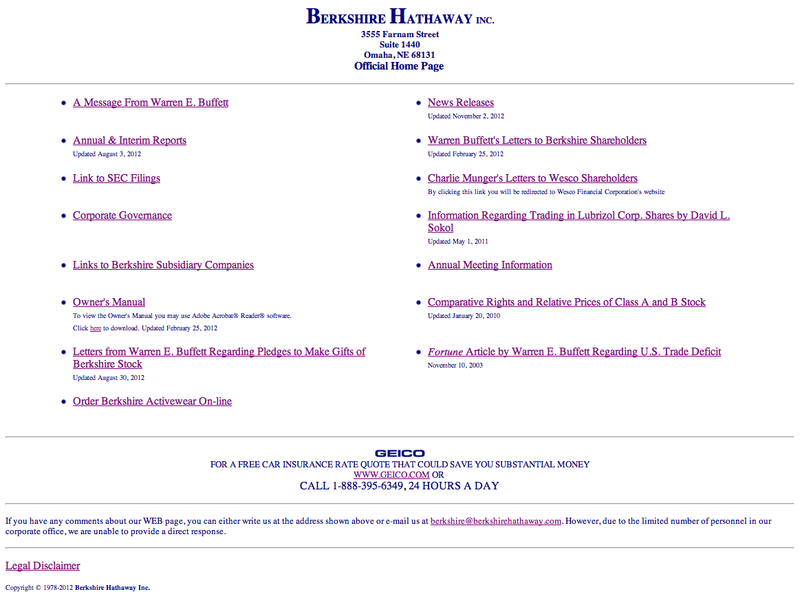 I immediately struck pay dirt with this approach, visiting the website in the #1 position, Berkshire Hathaway Inc. – the largest investment group in the U.S. View this screenshot of their website with reverence and awe, for it stands alone as a monument to clean design and precision-targeted user experience. After viewing the graphic of their home page or visiting their site, you may think I’m being sarcastic. But I swear I’m not. OK maybe a little, but not much. Because despite the fact that I make my living producing and designing websites and other collateral for online marketing, after pondering this site for some time I realized that I could not improve upon this website. Yes, I could make it look prettier. I could add functionality. I could re-platform it with a CMS. I could go to Getty Images and purchase stock photo assets featuring 20-something women in business suits standing in 30th floor office suites talking on their smartphones, and put those images into jQuery slideshows on the home page. I could do all of the above and still not increase the functionality of their website of Berkshire Hathaway Incorporated one tiny bit, or add one dollar of value to their investment portfolio.